then we have the product for you! Yes, you may have wondered why there was never a #9 3/8, a #16 1/2, a #17 1/2, a #18 1/2, a #18 3/4, or even a #19 1/2. Well, we here at The Superior Works wondered the same thing, and now through the miracle of the web, that wonder is now reality. Now you can take your common block plane, as long as it has a vertical post adjusting mechanism, and add a handle to make your tool one mean planing machine. Hard to believe, I know, but it's true. The Superior Works won't make your plane grow nickel plating, like in the after picture above, but we will let your plane grow a handle all at a price that's appreciably less than the several hundred dollars that it takes to acquire an original handle. Let's face it, there are times when we all would like to use a plane that's normally gripped with one hand in a two-handed manner, but find that the plane's size just won't permit a comfortable grip, nor a grip that affords any real control of the tool. Yet, there are times when the plane excels while being used with just one hand. With the handle, you can configure your block plane to suit the task at hand quickly and easily, making it function as a small, low angle smoother. 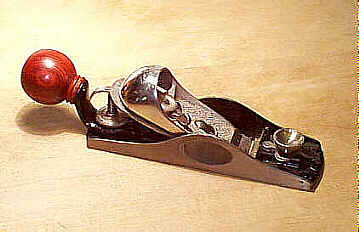 Really, now, who needs a #62 or a #164 when your block plane can do what those planes can, and at a much lower cost? 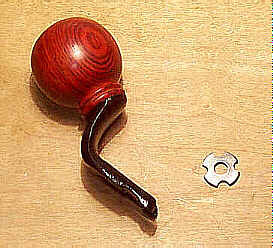 The handle is made of an iron casting onto which a nicely turned cocobolo handle threads. The casting is finished with a surface that's tougher and more durable than your plane's. The casting is slotted so that it slips around the threaded post without hindering the brass adjusting screws range. The casting is held in place with a lugged nut, which you can't buy at your hardware store since it's a custom thread. The handles are designed to fit onto plane's that originated in New Britain, CT (follow the B&G link below for the models). Due to the variations in the castings and machining over the decades of each plane's production, the handle's casting may need a quick touch-up with a file to make it seat properly, something that was done for each and every block plane and handle combination before it was made available to the public. The cutter's brass adjusting nut is removed from its threaded post so that the handle's locking nut can be threaded onto the post. The adjusting nut is then threaded onto the post, and you're ready to rock n' roll (this operation is only done once just so the locking nut can be added to the plane). When you want to add the handle to the plane, you simply slip it around the threaded post and tighten the locking nut down onto the casting. The lugs in the locking nut permit it to be tightened either with the tip of a common screwdriver or with a pair of needle nose pliers (my preference). The tail and its nut are $75.00ppd to America. If ordering from outside the USofA, please contact us directly for payment and shipping information by following the Ordering link below. If you'd like to order a block plane that already has the handle attached, ready to go, click here. You need to determine which locking nut to order as there are two basic styles. The threaded post comes in two different threads, a left and right. Most of the block planes out there have a left hand thread; i.e. the brass adjusting nut moves toward the plane's sole as you turn it to the left. For planes that have adjusters that move away from the sole as you turn it to the left, you have a right hand thread. Specify the thread, LH (left hand) or RH (right hand) when ordering. If your plane is of the Excelsior design (see image at end of page for Excelsior style), where the arch of the main casting is toward the rear of the plane (an asymetrical casting), you need to pay attention to this note. If not, go to the next note. If your plane does have the asymetrical casting, and you note a small letter "S" anywhere on the main casting, go to the next note. There are also two different handle castings, where the distance between the casting's "tines" differs slightly in order to make a better fit on the block planes. 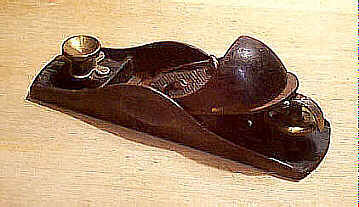 The earliest block planes have a narrower boss that carries the pivotting adjusting arm (the thing that engages the brass adjusting nut). Accordingly, the handle casting is narrower than it is on the later examples of the planes. Measure the width of this boss, and if its narrowest portion is on the order of 5/16" of an inch, order BP1. If it's wider than 5/16", order BP2. All the planes that fit in this note have a right hand thread, so your order would be BP1RH (if 5/16" wide) or BP2RH. It's also important to note that you may have to remove the threaded post from the main casting in order to add the locking nut on these earlier planes since the adjusting lever can't pivot far enough to allow the brass adjusting nut to be removed from the threaded post without breaking it. If your plane is the later style, with the symetrical casting where the arch of the main casting is at the middle of the sides or an "S" casting of the Excelsior design, then specify handle BP2. The vast majority of planes are of this configuration, and the order for the plane handle is BP2LH. When in doubt, odds favor that your block plane will require this handle and locking nut. If you can't figure out which handle to order, you can have one of the elves here at The Superior Works fit the handle to your plane for an additional cost of $10, for a total of $85.00ppd. One last thing needs to be mentioned. For those of you who may be concerned that a new handle will be indistinguishable from an original, it's easy to tell the difference - the original castings have a flattened boss with a coarse thread onto which the knob attaches whereas the reproductions have a circular boss with a fine thread. We won't allow anyone to accuse The Superior Works of intentionally defrauding the tool collecting public with an exact reproduction.